The past month was spent defending potential clients in Africa, who got dealt a particularly nasty set of hoax documentaries. We have to defend the people who buy less than 5% of the material we manage, only the best reuse stuff we have, because of their ethnicity. Clients and even Facebook friends tell me, "I've seen several documentaries about it." But to the point... Well, who the hell manages Good Point Recycling while I'm off doing this? Fritz Lang's Metropolis film inspired Joeseph Goebbells, Adoph Hitler's Nazi propagandist, to try to hire him for the white supremacy movement. What "e-waste" film documentaries should learn from Lang. So, have we all enjoyed the photos of fire and sweaty young recycling men? Have we proven that we care? Have we validated our recycling credentials, proven our concern, certified out downstreams, and licensed our morality? Not wanting to boycott reuse technicians in Tamale does not mean we care less than you do about wire burners in Accra who are exposed to toxic soil. Hopefully, my concern justifies my own photos. Because that's what Agbogbloshie is. It's a photo backdrop. Just a nice mashup of shantytown, smoke, gadget debris and glistening muscles. It has become a cheap movie set for #ewastehoax propaganda. The Tamale reuse workers not only support themselves, they usually support several others in their Dagbani speaking tribe who could otherwise feel forced to move to Agbogbloshie (Accra), Ghana to burn wires. And their scrap brothers in Agbogbloshie support not only themselves, but their own children, siblings, and parents. This is ultimately addressed to Lord Chris Smith, because the UK has given itself a special role as "steward" of the Dagbani and the secondary market in West Africa. He has proven his environmental credentials by circulating stories about the "largest e-waste dump on earth", the "most toxic recycling on earth", and has issued press releases crowing about Mighty Joe Benson. Clang go the prison bars. Yet clang, clang, clang go the Agbogbloshie scrap metal workers. Stop all the exports, arrest every #freejoebenson... Yet the beat goes on. In the morning after my 2nd trip to Agbogbloshie, I was copying a video (the reaction of the scrap youth to the laptop photos, during the filming by the American photojournalist), and while waiting for the files to open, searched "Agbogbloshie" in twitter search. I was stunned. This was Rachid, the young man who was sitting immediately to the right of Wahab Odoi the afternoon before,in a video I had copied to youtube that night. In today's Washington Post. We revisited Agbogbloshie in urban Accra yesterday. Having 9 days in Tamale, learning the Dagbani context, was important. It honed and shaped our thinking. Wahab and his 2 cousin/friends could focus their Dagbani translation on our questions, rather than siphon off the translation for American and Italian reporters. As importantly, we had 9 days to think about the questions we didn't think to ask on the first day. Since it was Agbogbloshie, of course there was yet another documentary being filmed that day... Justin from New York said he's a masters degree film student. That's basically all he'd tell us. This time we got to the wire-burning "hot spot" via the long and windy route. We saw much, much more of the scrap metal site and trash dump. It is indeed impressive in the context of a city of 1 million residents. Of course, this city has closer to 5 million. Recyclers will get my point... there has to be a lot of stuff still out in the city somewhere, waiting for a decision maker to let it be recycled. The white photojournalist had Awal (Howell) set up along the canal, sitting on a TV housing, with his back to the tire fires east of him. We took a vantage point under the sun canopy where the scrap burners and hanger-abouters rest and have lunch. Agbogbloshie as a scrapyard has little to do with wire burning, and the wire burning has much more to do with automobile wire than with "e-waste". But those wire fires, while a very small part of the equation, attract thrill seekers - unemployed teenagers and #greatwhitesaviors like me and "Justin". The site, seen from above, is mostly scrap automobiles, motorcycles, and bus recycling,. It's not the largest electronics dump in the world, not even in the top 100. Given the number of African households who have had electroncs for decades, there should be much more e-scrap. "E-waste" is a very small part of the scrap, apparently because Africans are still holding onto it, "speculating" that used electronics they don't use now will be sellable to someone. Today's Agbogbloshie is probably the tip of an iceberg as decades of reuse and repair will eventually cascade from a next generation of smart phone users. The purple text is my addition, by the way. On Monday or Tuesday, Emmanuel Nyaletey, Wahab Odoi, Wahab's cousin Peter and I will head back again to Agbogbloshie just to make sure we got this straight. What we photographed 10 days ago is supposedly the site which has received $1.2M in EU funds. Below is my amateur film of the place where the 20-50 units (monitors, TVs, PCs) per day were getting their wires removed. (199 view limit on Youtube until I have to black out unpermissionedfaces). I address the purple underlined "great white savior hoax" in the article above. It's the most ridiculous thing ever seen on planet earth. I'll be back there this week, if you have questions for the 27 people in Agbogbloshie who carry 446,000 pounds, minimum (2M tons for "millions" of tons) every day to burn it. That's per person, per day. With unpowered hand-carts. Truly the most outrageously exotic site BAN.org has ever "uncovered". It's agreed that constant improvement is necessary in Ghana. Traffic jams, electricity and water outages, flight delays, bad water, bribes and incompetence would not be acceptable in the USA or EU, and people shouldn't accept it here. Virtually nothing in Agbogbloshie's scrapyard, with a couple of exceptions, is remotely acceptable. "The majority of western diners at Chinese restaurants are being fed cat meat. 80% of those cats were sent by western pet owners to Chinese veterinarians". One would not want to condone eating cats, or deny it occurs, yet the broad statement would be considered outrageous, if not blatantly racist. Yet similar allegations made about Agbogbloshie recycling, illegal dumping, and Ghana importers of electronics throwing away 75% - "facts" equally stupid and outrageous - fill any google search for the placename "Agbogbloshie". Imagine if you googled "Chinese restaurant" and virtually every search result said the majority of western diners are fed cat meat... imported from Western humane societies." Ludicrous flamebait, yet accepted and repeated by reporters based on close ups of sweaty African faces. Not even any significant piles of "ewaste" cats in the photos. It's just shocking. Shocking educated westerners are repeating this BS. If Hugo, Dannonitzer, and other slum tourism cinematographers found a cat butcher and filmed the process of preparing cat meat, it might or might not be in good taste. That's not the issue here. The problem is that they allow their film skills to be used to denigrate honest businesspeople in emerging markets, and to somewhow give visual credence to a bogus hoax statistic. Basel Action Network made up fake statistics on more than one occasion (the 80%, and the 75% specifically attributed to "extensive investigation" in Ghana). Artists like Hugo and Fedele see a "fact" so alarming and outrageous that it excuses videographic exaggeration. Blacksmith Institute may not have technically asserted that Agbogbloshie was "scientifically determined" to be one of the Top Ten most polluted sites on the planet, but given the BAN.org "facts" they could smile and think they are accomplishing change. 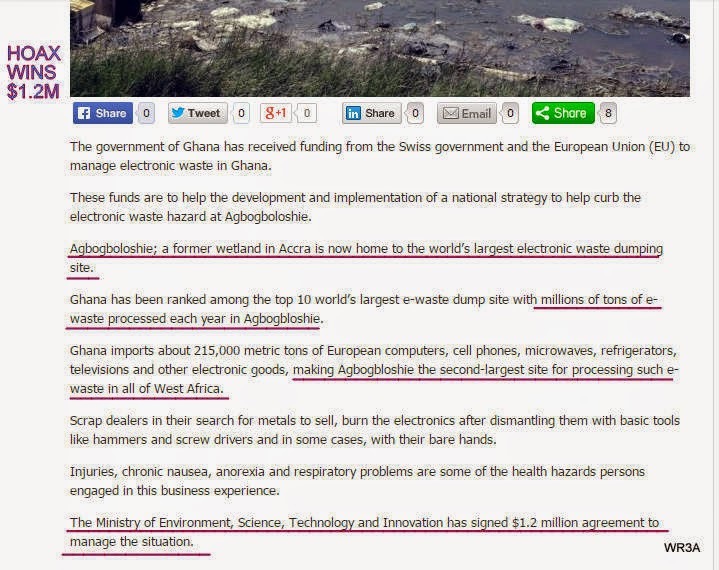 Or maybe everyone will see if recyclers admitting to export here (Ghana) would defend themselves. End of Week 2 in Africa. To catch everyone up, here are the cliff notes. 1) In 2002 three Americans were in Guangdong... Jim Puckett (BAN), Adam Minter (Shanghaiscrap.com), and yours truly. We saw different things. But the report with the least nuance (BAN's 80% dumping claim, claim that the water pollution was from e-Waste etc) got the biggest headline. Make the biggest claim, get the biggest coverage. Where there's smoke, there's Tires. Most of the visible smoke s from the tires. 2) In fact Guiyu China was not receiving the CRT monitors, they were going to SKD semiknockdown factories for remanufacture, and the water pollution found in "Exporting Harm" was telltale from textile dying. However, BAN ignored the nuance and created a Pledge of True Stewardship to raise more funds for their fledgling NGO. "It was a close place. I took . . . up [the letter I’d written to Miss Watson], and held it in my hand. I was a-trembling, because I’d got to decide, forever, betwixt two things, and I knowed it. I studied a minute, sort of holding my breath, and then says to myself: “All right then, I’ll go to hell”—and tore it up. It was awful thoughts and awful words, but they was said. And I let them stay said; and never thought no more about reforming." One of the most powerful paragraphs written in the English language. Mark Twain (like Dickens in 'Great Expectations' before him, and Harper Lee's character Scout in 'To Kill a Mockingbird' after him) uses the voice of a child to focus on a point in time when the majority of "respected" people were wrong. I've put most of this part of the trip into a 12 page chapter which I can't post by blog here, at least not yet. Here's the rundown. 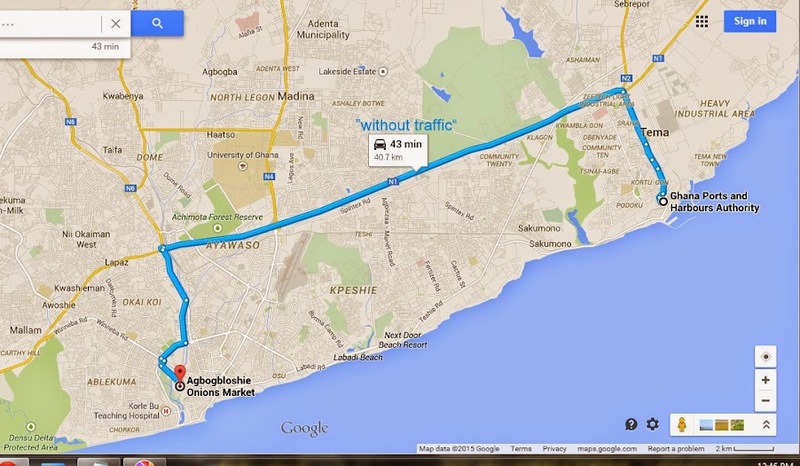 We were always planning on going up to Tamale, Ghana, in the far north, closer to Burkina Faso than Accra. But my host, Wahab, was contacted with sad news last Thursday AM. That morning, his father had passed away. Muslim funerals don't dally, and we had to drop some plans (to visit MakerSpace in Agbogbloshie on Saturday, and to meet Emmanuel Nyaletey on his flight from Atlanta) and to head north in a hurry. In a nutshell, Tamale has lots of recycled scrap. The age of the scrap is proof of the UN 2013 Report that said 85% of the "e-waste" found in African dumps (like Agbogbloshie) was productively used by African consumers for years and years prior to discard. If that means used goods should be banned, we should consider banning bicycles, used everywhere in Tamale, and imported by the thousands and thousands into Tema Port. Because after repairing and using and using, they eventually wind up here. Tamale is very different from Accra. If it was 1930 in the USA, Accra would be New York City, and Tamale would be Arkansas. The young men (labelled "scrap boys" - a "boy" term that makes my skin crawl when I use it) burning wire and scrapping metal in Agbogbloshie are mostly from Tamale environs. We were quite lucky, in fact, to have been brought to Agbogbloshie by Wahab and two of his cousins from the area. After an initial scowling at the cameras, those young men of Agbogbloshie were engaged in conversation with the three visitors in their mother tongue, and came to shake our hands. "E-Waste Crime in Ghana" Day 3: Port Tema Scene of Crime? I'm falling behind, it will be 7 days as of tonight, and I won't bother writing up every day of the trip. But the third day was also a long one. We went to watch the containers being unloaded, at the Port of Tema / Ghana Port Authority. Then we went to meet some personalities in the e-scrap realm in Ghana (some by accident). We thought we'd have time to stop at the Ghana EPA in the morning before heading to Tema Port authority with the USA reporter. The traffic was so tough it took nearly a half hour to circle the block looking for parking, and we were 41 kilometers from Tema, where the sea containers arrive. There is a lot of open land (and wetlands, we saw fresh eels for sale by fishermen along the highway) between Tema Port and Agbogbloshie. You can experience the drive on youtube, compare Accra traffic from the 1950s, and even see about the big, big plans for a monorail. Here in Accra, capital of Ghana, thirty years later, things have changed. Taxi. Toyota. Honda. Truck. Taxi. Mercedes. Infiniti. TaxiVan. Truck. Taxi. Truck. Jaguar. Truck, Hyundai, Taxi, GMC, Taxi, Taxivan, Truck, Nissan, Toyota.... and the sentence goes on and on for half a page. We were on our way to the "scene of the crime". The place Blacksmith Institute placed at the top of their list of most toxic places on the planet. Where Frontline interviewed Jim Puckett, describing the place where "most" of the world's e-waste goes. Where Mr. Mike Anane says 500 sea containers per month arrive for primitive dumping. Where several sources describe, and I quote, "Millions of tons of e-waste per year" are dumped and burned. The site described by Joe Benson's prosecutor as "common knowledge" that 80 percent (that #$%$ stat) winds up after Benson exported it. I will have to upload some of the photos later. Millions of tons (I actually had to edit that claim out of Wikipedia and identify the source had misquoted a study saying that was the world's generation, and then applied 80% literally to Agbogbloshie). That's 60 to 90 million CRTs, if it's at least 2 million tons. (I took about 150 photos, but most of my photos were of the photographers... I'll talk about why. The shots are too big to upload here from my Ghana pocket wifi Vodaphone transceiver. Some from Fair Trade Recycling e-waste reform Facebook Page). There were about 50 people, including myself and an American and two European reporters and my friends who took us there - my Ghana Geek pal Wahab, two of his cousins (all from same tribe and locale as the teenagers at the dump) and a lawyer and import agent. About 25 of them were "on the job". I'm in Africa. I see junk TVs here. I also see junk cars and tires. And traffic jams. Tomorrow, I will go to Agbogbloshie, to make my pilgrimmage as an exotic photographer. But before I go there, I thought I'd refresh myself on the history of television in Africa. I'm still concerned with what I call "The Banana Peel Fallacy", which I described in 2009's blog "Monkeys Running the Environmental Zoo". Activist goes to the zoo and finds the floor of the monkey cages covered with banana peels. He takes pictures of the peels. But it is a fallacy to accuse the zookeeper or visitors of dumping their banana peels in the monkey cage. There is no evidence of "banana peel dumping". As I said in the Zoo blog, I do not equate Africans with monkeys, but it describes both the fallacy of thinking you know what happened and a third party assigning victimhood to the consumer. In the analogy, the protester jumps to a conclusion. 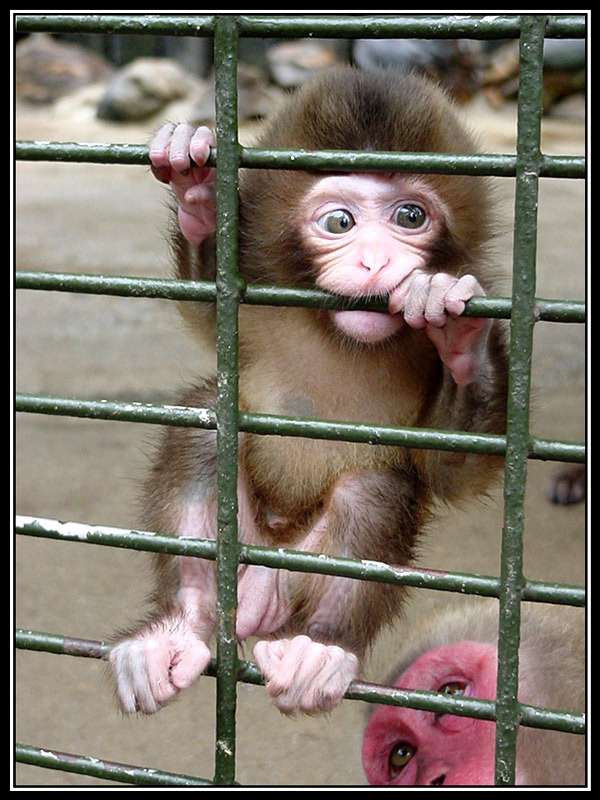 It's that protester who is seeing the emerging world as helpless zoo animals. Most African cities had television in the 1970s. But like televisions in the USA in the 1940s, they were a luxury device which could never have been afforded by the average African. In the 1970s, Americans and Europeans read about Africa through the lens of Idi Amin and Mobutu Seko Sede, Apartheid regimes in South Africa. Barely a decade earlier, most of Africa was still ruled by colonial law. Technically, many capital cities in Africa had television stations in 1959 or 1960, at independence, but tended to be "an elite an urban phenomenon" (Borugaul), and stayed that way until the advent of the Videotape Recorder / VCR. The VCR meant that any better-off African, not just those in the capital, could brag about their TVs. In the 1980s, black and white television was a forgotten technology in the USA and Europe, but some Africans benefitted by purchasing the used black and white televisions. But since it was an elite thing, most could opt for a used color TV instead. While broadcast stations and programming were limited, the VCRs and cassette tapes were ubiquitous. To the consternation of Hollywood, Nigerian VHS copies of movies became a world industry. Few African households could have afforded legitimate versions, but in a way Nigerian "copyright pirates" were helping Hollywood, by bringing their music videos and movies to audiences who otherwise would have grown up with Bollywood posters. I watched Sly Stallone's Rocky and Rambo, and Phil Collins videos (too many times) on a visit to a village south of Bamenda in 1985. My friends say around, commenting on Phil Collins' lyrics. "It would appear he does not care anymore. No, surely, this man does not care." Even my remote town in north central Cameroon had a few households with television before I left in 86. We had no post office, no bank, no hospital, and were blessed with a single paved road. The school I taught at was itself less than 4 years old. It was called a "pioneer post" by the Peace Corps staff, one of the most rural, a start-up program. But before I left in 1986, my landlord across the yard had a color television. It was used 1970s model, imported from England. Starved of facts and nuance, reports from African city of Accra - found on verge of catastrophe. Longtime a skeptic of "ewaste" dumping claims, WR3A Founder Robin Ingenthron arrived in Ghana last Sunday, and was shocked to find the situation far graver than he imagined. "It began when our Delta Airlines flight was unable to land," said Ingenthron. "We could see the junk televisions from 4,000 meters above Accra. They were scattered in stacks, up to 90 feet high, on the runway and tarmac, and along the highway." The Agbogbloshie dike, which separated greater Accra from the largest collection of electronic waste on the planet, had broken. Teenagers could be seen pouring out of the Agbogbloshie fences, trying to regather the discarded computers and televisions. But as fast as the kids worked to burn them, a tsunami of CRT televisions continued to spout through the gates, covering the streets of Accra and stalling traffic. Ingenthron and other passengers were dropped via small white parachutes, like baby Dumbos, into the zoo of e-waste. From the ground, the confessed electronics reuse kingpin came face to face with the toxic consequences of his "reuse excuse". As reported in The Guardian, by Greenpeace, and at weather.com, "millions of tons" of obsolete electronics arrived in Agbobloshie each year. At 34 units per ton, or 102 million TVs and monitors per year, 279,452 pieces had to be burned each day, keeping the 27 scrap boys who work in Abogbloshie on double shifts. American households throwing away an average of 2.8 TVs per day are blamed for the mess. Unfortunately, faced with the relatively small fires and lack of lighter fluid, the scrap boys had allowed a tinderbox of 10 decades of throwaways to amass.